Why have one switch when you could have four? This design lets you harness four relays for your lights instead of just one, all over Wi-Fi. In this tutorial, we will cover how to a build Wi-Fi-enabled, Internet-controlled switch connected to EasyIoT Cloud with four relays and one ESP8266. We will use the Arduino IDE to program the ESP8266. This Internet-connected switch is a simplified version of my ESP8266 internet connected switch. The program code is simplified — it's not plug-and-play, with a hard-coded configuration, but it uses four relays instead of just one. 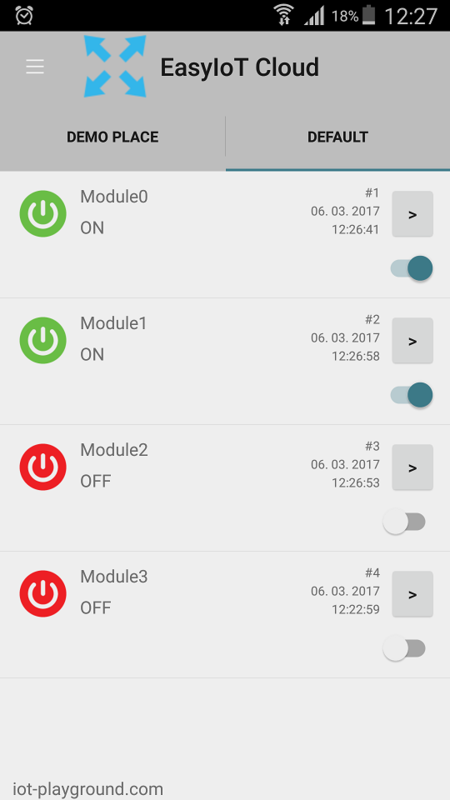 You can easily extend the program to control more relays with a single ESP8266. Relays can be controlled from anywhere in the world — you just need an Internet connection. Devices can be controlled over the EasyIoT Cloud interface or the native Android application. If you don't have any experience and aren't qualified to work with MAINS, I wouldn't encourage you to play around! Do NOT use this without proper knowledge about MAIN circuits and without a proper FUSE. Max current for solid state in this tutorial is 2A — suitable for room light only. First, register to EasyIoT Cloud. We will add DO modules manually. Go to Configure->Modules. 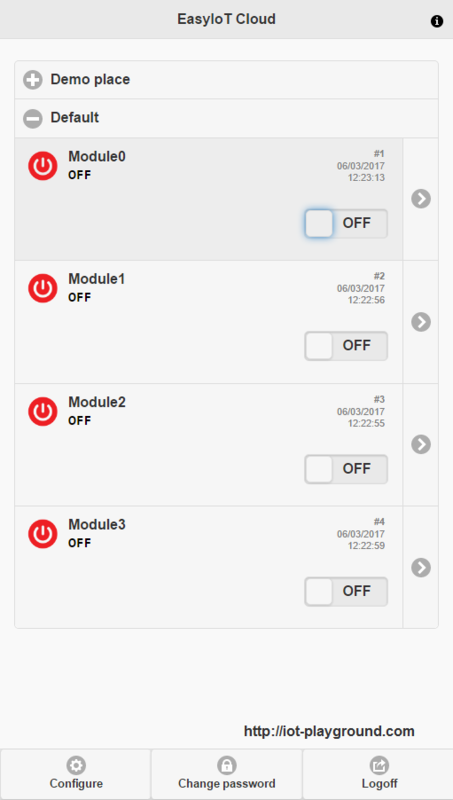 If there are demo modules, you do not need to delete them all. Press Add Module. 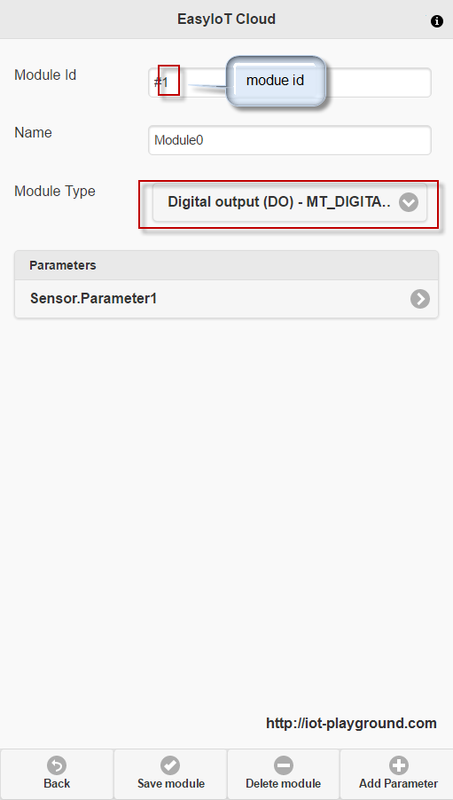 Change the module type to Digital Output DO (MT_DIGITAL_OUTPUT) and save it. It's important to remember the module ID. If this is your first module in your configuration, the module ID should be 1. Next, add more DO modules, in our case three more, but it can be dependent on your program and number of relays. The program is written in the Arduino ESP8266 IDE. Check out the Arduino ESP8266 IDE tutorial to see how to connect a ESP8266 module to a computer to upload a program. The program can be downloaded from our GitHub. You will also need the MQTT client library. Add this library to the library folder in the Arduino IDE. Our program uses the EasyIoT Cloud MQTT API. If you use different DO pins than the default D0, D1, D2, D3, change those pins. The easiest way to test program is to use an ESP8266 LUA node MCU board. Just connect it via USB port and you can test the program. If you use this board, you can also uncomment #define DEBUG to see debug messages. The Flash button on the ESP8266 board will work as a button to manually change switch state. The onboard LED displays the switch state. The GND is common, the ESP8266 is on 3.3V, and the relay module is on 5V. You can use a relay module with more relays (2, 4, 8). And there's your switch! As a note, modules can be manually renamed in EasyIoT Cloud configuration to suit your needs!